CANBERRA, Australia (AP) — Australia's new Prime Minister Scott Morrison on Friday promised a stable government at the end of a tumultuous week in which his predecessor was forced out of office, 13 ministers resigned and Parliament was shut down for an afternoon. Disgruntled government lawmakers forced former Prime Minister Malcolm Turnbull from office on Friday, arguing that most had lost faith in his leadership. Turnbull became the fourth prime minister dumped by their own party since 2010 in an extraordinary period of political instability that frustrates most Australians. Morrison distanced himself from the turmoil, saying he had not been part of the push led by fellow lawmaker Peter Dutton to oust Turnbull over four chaotic days that was inspired by a feud between hard-right conservatives and moderates. "We will provide the stability and the unity and the direction and the purpose that the Australian people expect of us," Morrison told reporters. "The work of government continues. I want to assure all Australian that those normal wheels are turning," he added. The political civil war has shocked business and industry that want crucial energy and tax policy reforms finalized. It's also an international embarrassment for a nation that prides itself on being a safe and stable democracy in which to invest. It is not clear who if anyone will take Turnbull's place on an important trip he planned next week to regional neighbors Indonesia, Malaysia, Thailand and Vietnam, which would end at an annual forum of 18 Pacific island nations on Nauru on Sept. 5. Morrison has been dubbed the "accidental prime minister" because he had no plans to nominate until Thursday when Turnbull declared he would not recontest his job. Morrison on Friday declined to detail any policy changes that he might make. "We intend to be governing ... so I don't think anybody should be making any plans for any elections any time soon," Morrison said. Turnbull said he would quit politics "not before too long." His resignation would cause a by-election that could cost the government its single-seat majority. It could also provide an incentive to call an early election. Turnbull, a centrist leader who takes credit for Australia legalizing gay marriage, blamed his downfall on a campaign by hard-right lawmakers backed by "powerful voices" in the conservative media. "There was a determined insurgency from a number of people," Turnbull said. "It was extraordinary. It was described as madness by many and I think it's difficult to describe it in any other way," Turnbull said. Turnbull said he was impressed by his party's decision not to reward Dutton and to elect Morrison, whom he descried as a "very loyal and effective treasurer." Morrison defeated Dutton 45 votes to 40. Dutton's failure prevents the Australian policy shifting to the hard right, although there has been little policy discussion in the leadership struggle. 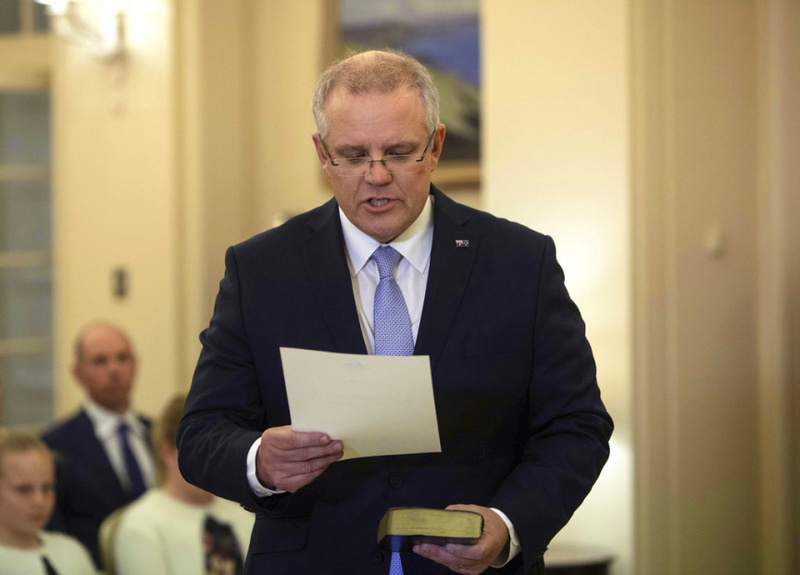 Morrison was officially sworn in as prime minister later Friday and his deputy leader Josh Frydenberg as treasurer, Morrison's old portfolio. Morrison said the rest of his Cabinet would be sworn in next week. Dutton's and Turnbull's camps waged the most chaotic, frenetic and at times farcical leadership struggle that Australian politics has seen in years, closing down Parliament on Thursday so that the government could focus on it its rapidly escalating internal crisis. Parliament does not sit again until Sept. 10. Turnbull's leadership was vulnerable because his government was trailing in opinion polls. Analysts expect the polling to worsen due to the clumsy and bungled way the leadership was challenged.